We’ve designed a custom PAC-MAN version of our Animated Card Cases for Tokyo-Pixel, our favourite Japanese brand of everything 8-bit! As you slide off the cover of the card case to get to your name cards, the retro pixelated PAC-MAN™ character animates, appearing to chomp on “Pac-Dots”, just as he’s been doing ever since the classic arcade game was released back in 1980. 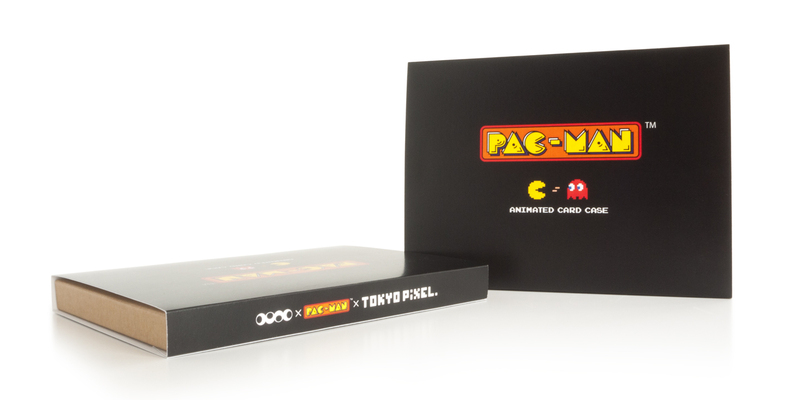 We had fun designing the packaging too, which features PAC-MAN & “Blinky Shadow” (the red ghost), mid card exchange. The bold graphic style of PAC-MAN worked great with our creative business card holder design, and we were so happy to collaborate with Japanese designer Mr.Oozu (pronounced oh-zoo), the super cool guy behind the the Tokyo-Pixel brand. Get your PAC-MAN™ animated card case here.